Very, very slow broadband on TalkTalk - The Scream! I've tested my broadband connection again this evening and low and behold I'm reaching the heady heights of 0.6 mb/s. Absolutely shocking in my personal opinion, especially seeing as I recently signed a new contract with TalkTalk. Does anyone have any advice on what I can do. I'm through spending a fortune ringing the helpline to be fed some rubbish by someone on the other side of the world. I'm in the exact same situation as yourself. Only my connection is 0.2mb/s.... NOT ONLY THAT! They're charging me an extra £8 a month for a booster package... claiming that I am exceeding my 40GB limit every month. Anyone know if I have any legal power here to claim back the money they're stealing and terminate my contract without incurring rediculess fee's? I.m also in the same situation as you guy's, im receiving 13k down and 36k up. i use to get 600k down and 36k up and i was happy with that but after talktalk did some work in my area ive been stuck with this 13k down and im sick of how talktalk treat their customers with no respect at all and after a conversation with a very rude talktalk operator from Ireland i said that's it im going back to BT so have just got my MAC code, but i'm stuck with this 13k download until the 9th June. if im ever asked what's a good isp talktalk will be last on my list and i would suggest you stay away from that hellish company. Last edited by tommy t; 24-May-2011 at 18:52. Hi Tommy' ya ive already got my MAC code and set-up a new BT account but have to wait for it to go live on the 9th June but looks like in the meantime im stuck with this talktalk 13k download. no Youtube Video watching or bbc iplayer for me i would rather sit here with 13k than phone talktalk thou and that's because i had very bad experience with them on the phone. yes that makes sense but talktalk always seem to be doing work in my area, and the last time they did they said i will loose my connection for a short amount of time but it will come back and its best to unplug the router for 30 sec then plug it back in, and all should be fine. and they was right i did loose my connection for 3 hours and when it came back, i had the same upload speed but only 13k download so i unplugged the router for 1 min and no change its still 13k, ive since then unplugged it loads of times and even reset it, then inserted my user/password back into it but its still 13k download, so it would be a very odd coincidence if any of my problems was to be related to my home equipment that has not changed or been moved in anyway. ill give that a go tomorrow if i get time but would mean setting up power extension lead and moving pc and monitor into the hall but worth the hassle if it means i find the coarse of the slowdown. all ive tried is replacing the adsl filter. I tried connecting the router to the main socket at the front door but no change it was still 13k download. talktalk phoned me and said i would be billed £117 if the fault was in my home as i still have 5 months remaining on my contract so they sent out an engineer today and he tested all my equipment and said the fault was not my end and also said it comes up that the line is good and should handle up to 9.5Mb but for some reason its only giving 13k/ 0.13Mb he then said he cant do anything about it as ive requested the MAC code and BT now manage the line but i don't get that because BT is not set to go live until 9th June. the engineer also said it could be my "ip profile" at the exchange that's at fault. 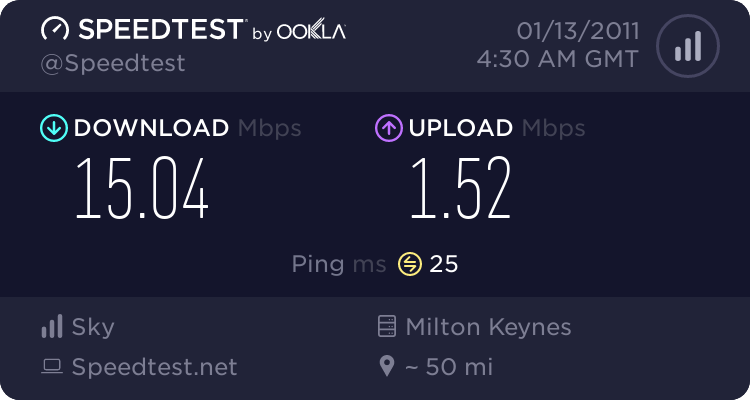 My experience with talktalk is at an all time low, they are the worse isp ive ever been with and will stay a million miles away from them in the future. so im stuck with this 13k until BT goes live and even then it could be slow so will need them to look into it. i cant believe in 2011 we still have to go through this crap just to get a decent internet connection. Im back with BT now and straight on with 300k then next day up to 500k and now im on 650k and im able to watch youtube vids and do everything that i use to like download games etc.. ill never go back to talktalk they are the worse company ive ever had to deal with. I had the same problem..! In the shop and at the phone they just wash your brain with so many information that you are keen to try it!!! I am now back with Bt and I am totally fine..wish I wouldn't never changed it!! I can only say that my brother on the south coast joined TT about 5 years ago, and has had no real problems with speed or connections, save the odd hiccup with email servers. For myself, I only joined them about 10 months ago, and I have to say that I get speeds around 8Mb download and 0.7Mb upload. For me, their service (with phoneline) is lots cheaper than BT, who imo, need to get their act together ! On the other hand, if I could get sky/Virgin cable, I'd go for that like a shot ! 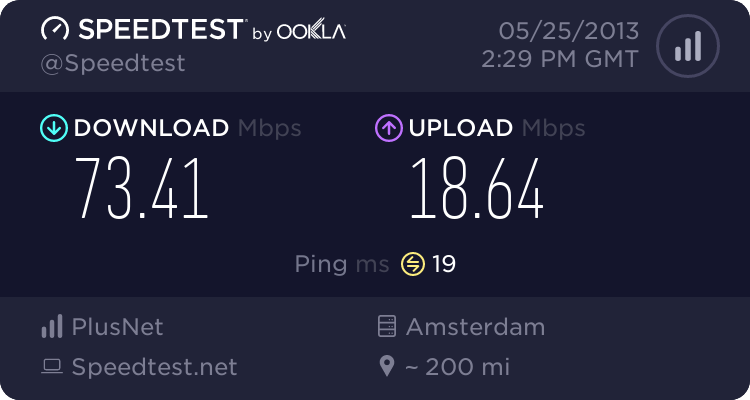 Since I Ever Joined Talk Talk My Internet Connection Was Very Slow And They Said To Me That I Could Get Upto 24meg, And I Was Getting 18meg, I Was Unable To Watch Youtube Video's And Download Podcasts And Muisc. I Tryed To Leave And They Put My Bill Up And Witch I Can't Afford Pay, I am Now On Virgin Media And I am Getting It Upto 20Meg And My Brother Has Got It All Linked Up To A Network Switch, And It Is The Best Internet Ever! I Hate Talk Talk And I Wouldn't Recomend Them! If you join the TalkTalk Members forum we can provide online based account support and assistance for any issues you may be experiencing. 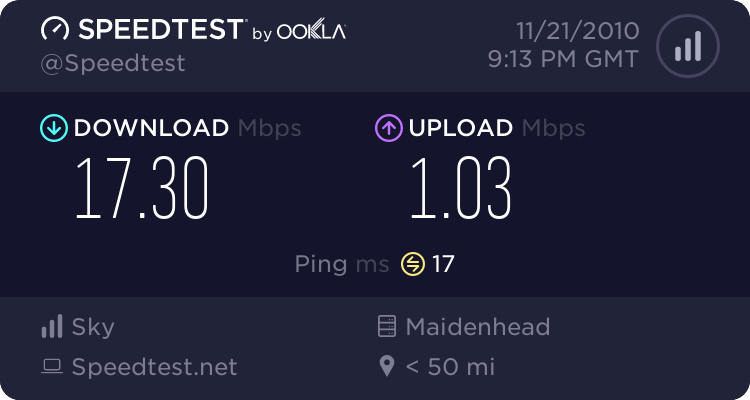 I went with TalkTalk about 5 months ago as they promised me 40 speed, it has always been awful and we get a maximum of 1.7, after countless calls, emails etc I was told the maximum we could get due to the line is 1.7. I phoned the helpdesk and clearly stated if I am paying a fortune for 40, they need to get me at least the 70% of 40 that I am paying for, but I keep getting fobbed off. My housemate is reliant on a good internet connection for work which is why I was prepared to spend a bit more to get a stable, reliable connection. TalkTalk is a joke when it comes to customer service and internet connection, my advice...... Stay well clear! Up to a week ago, I was having lots of problems for several weeks; line dropping, slow responses etc. I started keeping a record and phoning them, using the free number, every time a problem arose and after a few 10 days they offered to send an engineer to my house to find out what is wrong at a cost of £50 if either there is no fault or the fault is in my house! At one point they wanted me to phone back on a mobile after they had run some tests, but I told them my credit had run out. They obviously think that if they make it inconvenient for the customer that maybe they will stop complaining! So I told them that their service was unacceptable and that if they couldn't fix the problem within one week, at no inconvenience or cost to me, then I would switch to another ISP. They said they didn't want to lose a loyal customer, but they have standard terms and condition. So I told them that I ALSO have standard terms and conditions. After clarifying my terms and conditions, I ended the call. Another complaint to add from me. We've been with Talk Talk for about a year and for the last month or so our connection has been really temperamental. It's generally fine during the day but in the evening it just hits a wall and for us an internet connection is just non-existant. Couldn't even get the speed test to work. Phoned the helpline the other night and explained that we weren't getting anywhere near the standard we've been paying for, and the first suggestion they made was that we should pay them more money for a fibre connection. Ridiculous! Find out what speed you should be getting, and tell them that unless they fix it within 10 days, you'll terminate their contract and report them to trading standards. Thanks for the advice Centaur...I'll look into that! Contact with you vendor for slow connection.